Editor’s Note: Tanya from Eat Laugh Purr is back with some fabulous but frugal date night ideas for you and your sweetheart. Whether you’ve been married for more years than you’ve been single or are in the first blush of love or are somewhere in between, to keep romance alive and well, you still need to enjoy the occasional date night. Some date nights are meant to be celebratory where you spare no expense (although still mindfully and within budget, please). Those are certainly nights to remember, but most us can’t afford to spend a fortune on every date, no matter how much we love our special guy or gal. It’s a good thing that a fabulous night out doesn’t have to break your piggy bank. There is nothing wrong with the occasional splurge date, but in between indulgent nights out, here are a few easy ways for couples to stay connected and have fun without spending a fortune. It’s easy and low-key and a classic for a good reason. You can either rent your favorite movie, borrow it from your local library or download it from Hulu, Netflix or Amazon, then grab a bowl of buttery popcorn and get cozy on your sofa or bed. There is nothing more romantic than watching the sunset together. Put together a little picnic with some finger foods, like cheese and crackers and your favorite wine or beverage. Grab a blanket and find someplace quiet and secluded where you can watch and toast the sunset together. This is perfect for the couple whose budget isn’t simpatico with the fanciest restaurant in your city, but the foodie in you still wants to dine there. Get dressed up in your best and enjoy a decadent dessert instead of having a full meal and a big bill. Avoid the dinner hour and wait until the end of the night, so you can savor every bite together. Not every date night needs to be about each other. Sometimes helping others and putting them first, brings you closer together. Consider volunteering at a humane society or another favorite charity. Doing good together makes your bond stronger. During the summer months, many cities offer free outdoor concerts. Check your city’s visitor website to find upcoming events. Your place of worship, local schools and nearby colleges are other possible options for finding free or low-cost concerts and events. Make it fun by not serving a fancy or fussy meal. Instead dress up, light the candles, put on some tunes and serve hamburgers, pizza or hotdogs. Or whatever the two of you enjoy eating that is also easy and convenient to make. Because as nice as a fancy, romantic meal might be — it usually means a lot of work and clean-up, which isn’t very romantic. Keep it simple so the focus is on the romance! Whatever the weather, there is still lots of fun activities to do. Enjoy a game of mini-golf where the loser buys ice-cream. See who has the better aim with a paintball battle. Have a water gun fight in the summer and stay cool with root beer floats afterwards. Or have a snowball fight during the winter and warm-up with a mug of hot chocolate or apple cider. Get close to nature with a nice hike or bike ride. Bring out your inner kid with a visit to your local water park or arcade or fly a kite at the beach or park. Get out and enjoy the bar scene by going dancing or supporting a local band at your favorite club. If you have good pipes (or even if you don’t), find a karaoke bar and enjoy some laughs whiles you sing some tunes. If the bar scene isn’t your style, enjoy a poetry reading at a coffeehouse or explore a museum or art gallery. Support one (or more) of your local amateur sports teams. It’s fun without the insane parking and $12 beers. Invite friends to join you and host a tailgate party before the big game. Another option: if there is a sport you both enjoying playing, see if there is a couples league you can join and go from spectator to player. We can be creatures of habit. We take the same route to work. We order the same meal at our favorite restaurant and so on. Let’s switch things up a bit and try something new. It can be a new sport, a new game (board, card or video), a new hobby, a new recipe or type of cuisine or a new restaurant. Anything you’ve wanted to try but simply haven’t made time for it. Setting goals together is one way to keep a relationship strong. Your bucket list is all the things you want to do together before you die. Figure out what those things are and when you want to achieve each one. Now you know how much you need to save and can start planning. This isn’t work, people. This is the groundwork for making dreams come true. Video games aren’t just for kids. You can go old school and dig out fan favorites, like Pac Man and Donkey Kong or your new favorite game. If you’re really into video games, dress-up in cosplay (I won’t tell) and make it fun with some adult prizes (I’ll let you decide what those might be). Turn it into a theme, like finding mementos from your first date or wedding, and hide items within your home and yard. Don’t just hand them a list of items to find either. Make a list of questions that fit the theme with each correct answer revealing a clue. Or if the thrill is more about hunting and exploring the city together, try geocaching. This date night is probably a little more expensive, but it can still be low cost if you do a couple of things. First, keep it to one brewery or winery. It’s when you turn into a full day, visiting multiple locations, that greatly increases the cost. Plus, too much imbibing means either needing a sober friend or a car service to take you from place-to-place. Second, you can often find discounts on wine and craft beer tasting through such sites as Living Social or GroupOn. If you enjoy wine and/or craft beers, it’s worth saving your pennies to do this. This is a grown-up date night for you and your friends. Prom in high school likely had lots of pressure around it while this night is purely about having fun. You can keep it low-cost by hosting it in your background (or the friend with the biggest backyard). String up Christmas lights to make it romantic and start the evening late — after 8:00 PM so you don’t have to serve a meal. Layout a few, easy finger foods and serve an alcoholic punch versus an open bar. Or have guests bring wine, champagne and beer to share too. 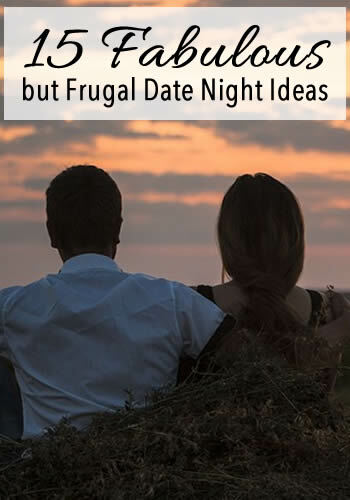 What are some of your favorite frugal date nights suggestions? Tanya is a freelance writer, web designer and blogger. You can find her at Eat Laugh Purr where she and her ginger tabby, Max, enjoy simple pleasures every day, including delicious food. Connect with Tanya on twitter and Pinterest. And please, no judgement on the number of cat pins I have. My favorite on this list is "enjoy the local scene". In Columbus there is so much to do and see - just walking around in the Short North area is a date by itself. One of the nice things about city life is there's always something to do - and you don't have to spend money doing it. I am so guilty of NOT enjoying the local scene. I do the same things when there is so much to see and do, especially in LA. It is an expensive to live in, but there is lots to do, even without spending money. I obviously need to take my own advice. Glad you're exploring your city, Natalie. I've never been to Columbus but heard good things! Thanks for the great ideas! Being a movie buff, I'm a big fan of number 1. Also, I think that using public transportation to tour the city is fun. Some cities have ferry's as public transportation that provide great night views of the city. Or you can take the bus to a cool neighborhood, walk around randomly and enjoy each others company experiencing a new place. Great suggestion! You are absolutely right that lots of cities have interesting modes of public transportation, often times for free or for very little. I love the idea of going to a new-to-you neighborhood and exploring. My wife loves sunset picnic and outdoor fun activities. We have had picnic for many times but playing badminton has been one of our interests, which is one that we look forward to doing every Saturday evening. Nice ideas especially "Video Game Challenge," which we'll be doing later this afternoon and we can't wait for this. Sunset picnics are so romantic and really easy to put together too. It's nice that you and your wife have a standing badminton game every Saturday night to look forward to. Enjoy the video game challenge! I think it's fun when you do old school video games too!